Van Nuys is in the center of the San Fernando Valley region of Los Angeles. The main thoroughfare, Van Nuys Boulevard, is known for its car dealerships. The TV show Beverly Hills 90210 was filmed on a set in Van Nuys. The city had an estimated population in 2000 of 136,443 people. Given the large amount of families within Van Nuys’ community, it is crucial that any matters involving divorce, child custody, child support or spousal support be handled by skilled California family law attorneys. 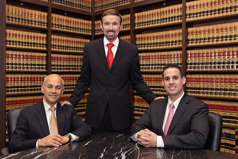 The Van Nuys divorce lawyers and family law attorneys at Wallin & Klarich have many years of experience handling cases for clients facing the challenges of divorce, division of property, child support enforcement, child custody, annulment, domestic violence and restraining orders. Given our long history of operating in the area, we have a long-standing familiarity with local courts, district attorneys and judges that afford our clients the Van Nuys family law representation and counsel they need to assure a positive outcome in their case. The Van Nuys, California divorce and family law attorneys from Wallin & Klarich have the knowledge and resources to make sure that high and low profile cases are resolved swiftly and professionally. Whether you are facing Van Nuys domestic violence, child support, modification of custody, or paternity, the Van Nuys divorce and family law attorneys at Wallin & Klarich will exhaust every possible resource to protect the rights of you and your family. At Wallin & Klarich, we’ve seen just how stressful legal matters can be for our clients and their loved ones. If you or someone you love is facing divorce or family law matters in Southern California, you need to call Wallin & Klarich today for an evaluation of your case. Call 1-888-749-7428 to get in contact with an attorney today. What is Alimony and Do I Qualify? How is Guardianship Different than Parenthood?